Physicists achieve powerful acceleration by ‘surfing’ electrons on proton waves over short distances. An experiment at CERN has demonstrated a new way of accelerating electrons to high energies — one that could dramatically shrink the size of future particle accelerators and lower their costs. The technique is the latest entrant in a hot race to develop a technology called plasma wakefield acceleration. The method uses waves in plasma, a soup of ionized atoms, to push electrons to ever-higher energies over distances much shorter than those required in today’s particle accelerators. Several laboratories have demonstrated plasma wakefield acceleration using two different approaches; most teams use laser beams to create the plasma waves needed. The latest work is the first to show that protons can also induce the waves and achieve electron acceleration — a technique that may have advantages over the others because protons can carry high energies over long distances. In this case, researchers﻿ diverted protons that would usually be fed into the Large Hadron Collider (LHC) at CERN, Europe’s particle-physics lab near Geneva, Switzerland, and instead inserted them into the wakefield accelerator, called the Advanced Wakefield Experiment (AWAKE). The machine worked as expected and created a consistent beam of accelerated electrons. “That, for us, was a major achievement,” says Matthew Wing, a physicist at University College London, who is deputy spokesperson for AWAKE. “It essentially says that the method works, and it’s never been done before.” The work is described in Nature1 on 29 August. In AWAKE’s first experimental run in May, the team accelerated electrons to energies of 2 gigaelectronvolts (GeV) over 10 metres. In principle, a much larger version of the experiment that took protons from the LHC’s main ring — rather than from its lower-energy sibling — could push electrons to energies of teraelectronvolts (thousands of GeV) in a single, kilometres-long stage, Wing says. “This would be a compelling accomplishment, as there are no laboratory sources of teraelectronvolt electrons currently available,” says James Rosenzweig, who leads the laser plasma wakefield research team at the University of California, Los Angeles. Proton ‘wakes’ were first proposed as a potential method of accelerating electrons less than ten years ago3. “It’s really impressive that here we are — in a few years, it’s gone from nothing to a really significant experiment,” says Mark Hogan, a physicist at the SLAC National Accelerator Laboratory in Menlo Park, California, who works on a plasma wakefield experiment there. While the LHC, the world’s most powerful accelerator, circulates protons in a ring, most accelerator labs in the world use electron beams, typically produced by linear accelerators. Most electron accelerators use powerful radio-frequency waves to carry electric fields that push a beam of injected electrons, which gain more and more energy as they move inside a high-vacuum pipe. Stronger electric fields accelerate particles over shorter distances, so doubling the field strength means reaching the same energies with an accelerator half as long. But the electric fields in these conventional accelerators cannot reach much more than 100 million volts per metre. Conversely, in a plasma wakefield accelerator, electrons move inside a mixture of electrons and positive ions instead of empty space. Until now, there were two established methods for achieving this acceleration. One is laser-driven, where a laser’s oscillating electric field pushes the plasma’s electrons sideways, whereas heavier, positive ions respond more slowly and essentially stay in place. The resulting separation of positive and negative charges greatly amplifies the laser’s electric field. This can create small regions in the waves where electric fields reach up to 100 billion volts per metre — 1,000 times greater than achieved by conventional acceleration. Researchers then inject bunches of electrons that are strategically timed to ‘surf’ inside those regions and gain energy. Several labs have been working on the laser technology, which does not require large infrastructure but is limited in the energies that it can impart to the injected electrons within a single plasma stage. In principle, the electrons from one such accelerator could be fed into another one, ramping energy up at each step4, says Wing. Hogan and others at SLAC have pioneered another plasma wakefield acceleration technique, which produces plasma waves using separate bunches of electrons. One bunch is inserted into the plasma and creates the first wave by repelling the plasma’s electrons away. Another bunch follows in its wake; while the first bunch transfers energy to the plasma, the second takes some of that energy back and accelerates. In 2007, Hogan and his colleagues showed2 that they could impart to electrons as much energy within 1 metre of plasma as SLAC’s historic linear accelerator did down its entire path of 3 kilometres. Then, in 2009, Allen Caldwell of the Max Planck Institute for Physics in Munich, Germany, and his collaborators proposed yet another approach3: inducing the plasma waves with protons rather than electrons. 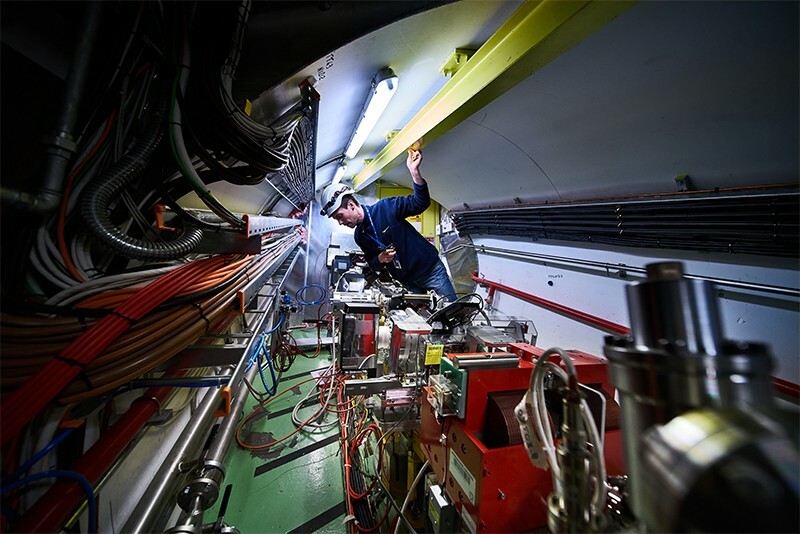 To put that proposal into practice, CERN built the Advanced Wakefield Experiment (AWAKE), a US$25-million facility that occupies an experimental hall 100 metres underground, inside the LHC’s ring. AWAKE takes protons from a 6-kilometre ring at CERN called the Super Proton Synchrotron — which normally feeds the particles into the LHC’s main, 27-kilometre ring — and shoots them down a 10-metre-long cell filled with rubidium plasma. A specially built smaller accelerator produces electrons that are inserted in the protons’ wake. The acclerator achieved beam energies of 2 GeV and upgraded versions of this set-up might produce electrons with energies of up to 100 GeV, says Wing. Energies in even the 50-GeV range could be useful for experiments in which electrons are shot at a fixed target, Wing adds. In many applications, energies that are simply very high will not be enough, Rosenzweig and others warn. Beams must also be high quality — for example, with regard to how electrons in each bunch differ in energy from each other and how tightly packed they are. The accelerated electrons could in turn be used to produce high-intensity laser light. This application could create more-compact versions of instruments, such as free-electron lasers, that are used in other scientific fields to probe materials and molecules. Correction 05 September 2018: The original version of this article incorrectly stated that multi-stage laser-plasma acceleration has not been tried before. Adli, E. et al. Nature https://doi.org/10.1038/s41586-018-0485-4 (2018). Blumenfeld, I. et al. Nature 445, 741–744 (2007). Caldwell, A., Lotov, K., Pukhov, A. & Simon, F. Nature Phys. 5, 363–367 (2009). Steinke, S. et al. Nature 530, 190–193 (2016).